Flint Expatriates: What does the city of Detroit have against Tiger Stadium? What does the city of Detroit have against Tiger Stadium? The city of Detroit, in typically incomprehensible fashion, seems determined to obliterate any remnant of Tiger Stadium, despite the efforts of the Old Tiger Stadium Conservancy. Detroit Economic Growth Corp. Vice President Waymon Guillebeaux says the stadium will be leveled as soon as a contract is negotiated with a contractor. And what is Waymon's rationale? “We cannot have a partially demolished building remaining indefinitely,” Guillebeaux told The Associated Press. Of course! Detroit has a long-standing policy against buildings in disrepair. They do such a great job of enforcing this rule that I bet you can't find a single vacant, crumbling building in the entire city. It makes perfect sense to tear down what remains of a landmark to keep the city looking clean and tidy. And think of the development possibilities for the corner of Michigan & Trumbull. With Motown's booming economy, you can't waste valuable land on a memorial to one of the city's greatest structures and a ballpark for kids, which is what the Conservancy is proposing. The Old Tiger Stadium Conservancy is shocked and dismayed that a decision was made by the Economic Development Corporation to demolish the Navin Field portion of Tiger Stadium without consulting the Conservancy. The Old Tiger Stadium Conservancy has made considerable progress to move the redevelopment of this property forward by securing millions of dollars in earmarks, grants and tax credits, as well as state recommendation of historic designation. Plans are well underway to redevelop this property into a viable and self-sustaining commercial property, a much-needed venue for supporting local youth and amateur sports, and a usable and attractive community green space as exemplified by similar preservation efforts by the Detroit Riverfront Conservancy. The Old Tiger Stadium Conservancy project will be a major contributor to the economic development of the City of Detroit, connecting southeast Michigan to the state and the entire region. With a new administration in place, we demand that the City not be shortsighted in its vision for the future. We ask that development officials stop demolishing our heritage and instead, develop mixed-use opportunities that promote economic vitality, cultural tourism and healthy green spaces that interlink and sustain neighborhoods. 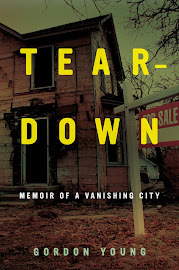 By demolishing, the City loses $22 million in credits and earmarks and adds another vacant lot in the City of Detroit. Apparently, the policy is to save the City by demolishing it. We encourage citizens to contact the Mayor’s office as well as Detroit City Council to voice their concerns. No dispute here, Gordon. When I saw that announcement, I had to wonder whether there's something else at play here. On the face of it, it makes no sense. But, then, it's China-- er, Detroit, Jake. The Tiger Stadium decision is just mind boggling. The Conservancy's Plan is the best one going (maybe the only one) and this voting group (whoever they are) has decided to stomp on that! Is it to improve the view of I-75 and the Briggs neighborhood from Corktown??? Other than that, I can't imagine what the rush is…..I also thought that Carl Levin had attached some redevelopment funding to one of the bank bailout bills. Did that get axed? Historical Preservation in Detroit can be a discouraging endeavor. Sable, a $3.8 million federal earmark is still in place, should the city choose to use it. Apparently, they don't want it. Keith Olberman voted George Jackson Worst Person in the World on the June 2nd show.